Whilst visiting Rome I stumbled across a curious painting by a follower of Hieronymus Bosch called ‘The Conjourer’ (c.1475-80) in an extraordinary exhibition, tucked away in a 16th century palazzo just a few streets from the Pantheon. There are at least five versions of this painting known to exist and none of them are believed to be by Bosch’s hand – they are all highly skilled period copies. It is possible that Bosch employed members of his own family to produce faithful reproductions of his works for dissemination as demand for his work was high, and this enigmatic image has filtered down to us across an expanse of some 540 years. The painting which measures 53 x 75cm is on a wooden panel and is in remarkable condition. One is immediate struck by the blackness which surrounds the scene – a sort of encroaching fog forms a vignette around the people in the picture. A dense veil of darkness, the mists of time, surround it. 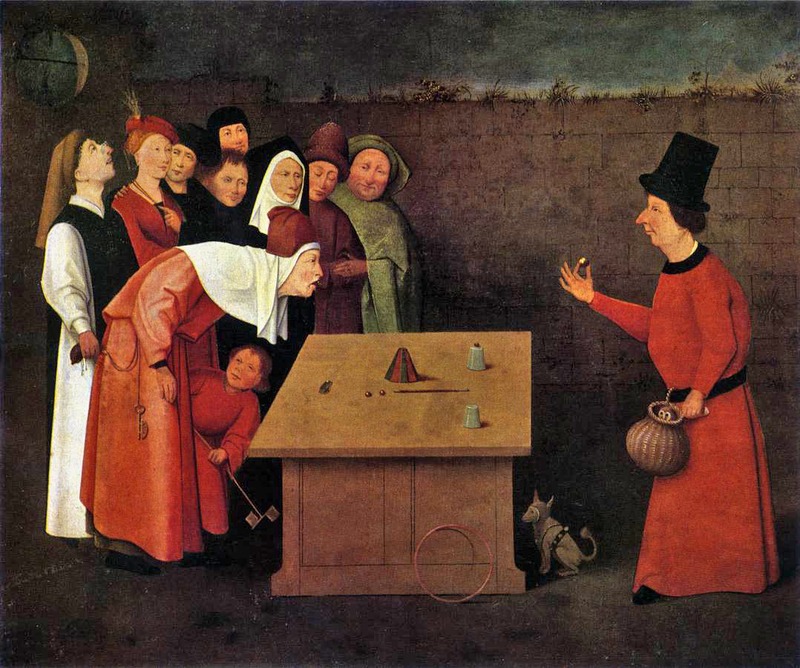 For me, this image is a snapshot of a medieval performance that portrays legerdemain – sleight of hand. The magician is a crafty confidence trickster who works in tandem with an experienced pickpocket (who can be seen stealing an elderly gentleman’s purse) and perhaps a small boy, who acts as a decoy or distraction within the crowd by waving his toy wind vane. The painting confronts us with these immutably interlinked relationships which on the surface seem apparent but after some consideration represent an intimate symbiosis that spell out a poignant message for us in our time. One’s gaze is directed across the painting by the use of red which colours several of the characters clothes sweeping from left to right. The child wears the same cloth as the magician establishing the link with him – is he perhaps, his son? As usual in Bosch’s work there are many hidden meanings encoded in the layered symbolism of the picture that invite speculation. My immediate fascination with the image captivated me during an impromptu visit and I wrote several pages of notes in the 25 minutes that I was able to inspect it up close. A cautious and possibly bored attendant came over to me and reminded me that ‘no photo’ must be taken of the painting, even though I had no camera or any intention of trying to photograph it. When he saw me writing he allowed me to stand slightly closer to the picture with a magnifying glass so that I could pick out the strange nuances and ponder as to their significance. ‘Writer?’ he said to me in mock obeisance approvingly. In the spirit of the conjourer’s world of multiple illusions I said ‘yes’ if anything, to appease him. Hanging from the magician’s belt is a gourd shaped wicker basket with an owl’s head popping out at us. It is conjectured that the owl symbolized evil in the medieval times but I think this interpretation is too obvious and crass. Who comes up with these lamentable theories? Instead, it was probably an unusual kind of pet bird, kept as a specimen to show off at fairs and trained to catch mice. The penchant for domesticating exotic animals during this period is well recorded in paintings; you only have to think of Leonardo’s Lady with an ermine to find hard evidence of this fact. The mesmerized old gentleman who is being blatantly robbed stares in stupefaction at the beak nosed charlatan. From his mouth there emerges a frog as if by magic. On the square table (which looks more like a plinth for a sculpture) there’s another frog and an arrangement of cups, one of which is conical and striped, a stick and some balls or marbles. The magician holds one of these spheres between his thumb and forefinger. Cups and balls is a game that has been around since time immemorial. Which ball is underneath which cup? With the shuffling of vessels and the switching of different balls there is much trickery to deceive the keenest of observational powers. Like the frog that pops its head out of the curmudgeon’s lips, nothing is quite what it seems in Bosch’s world of moralistic allegory and the blurring of fantasy with reality is intended to induce confusion and obfuscation so that ultimately the trick can be a success and the audience is hoodwinked. A scene such as this could have come from everyday life in the 15th century which is what makes the picture so compelling and persuasive to our modern eyes. We feel like we are there too eavesdropping on this event just as we are in the exhibition where the picture hangs. All we lack are the requisite garments, wimples and hoods to join the merry throng of ‘real’ onlookers. The allure of small paintings to entrance us lies in the wealth of astonishing detail they possess. Eleven people in this picture are framed by an old wall, full of cracks and weeds (mostly grasses) which sprout from its ragged top. What lies beyond the wall? Bosch includes a Gothic window, which may be a part of a ruin and is certainly too early to be a folly. There is a stork perched on its nest delineated almost in silhouette. We cannot see through the window into the landscape behind the wall and are forced to concentrate on what is happening in the foreground. Beneath the table a small dog wears a weird studded leather outfit which in our times may look fetishistic (more S & M than M & S). This is perhaps, another of the magician’s pets? The same dog appears in other paintings by Bosch, most notably in The Garden of Earthly Delights. There are many unanswered questions posed by the occupants of the picture. I returned to the palazzo several days later, thinking it would be empty as it was a Sunday and people in Rome are supposed to go to church rather than revere metaphorical paintings. To my chagrin, I was caught up in a flurry of tourists being herded around the galleries in slow motion under the tutelage of a droning guided tour. Waiting patiently for the din to subside and their bodies to move on to the next room, I found my moment with this picture again. This time, I had 15 minutes to study it under the hawkish gaze of a stern lady attendant. My realisation was that many of the performances I have been making in recent years bear some relation to this composition. The fact that I always use draped tables of different sizes to display objects that conceal and reveal other items is parallel to what it going on this picture. My use for the colour red is translated into the costumes/masks I often wear in performances which have subconsciously emanated from Bosch’s predilection directly into my psyche. Performances which take place around a table top invariably brings to mind magic shows and the concept of display for amusement, demonstration and entertainment. Sadly, in the commercially driven art world of today these qualities are engagement are something of a rarity. Conversely, there is much to be nullified by in the art world and I find myself wondering, if like the magus in this little painting by someone in the school of Bosch, why much of so-called modern art could be viewed as a sly stratagem of artifice and an even bigger form of mass deception played out on the general public by cynical, consummate pranksters. Many of the bogus artists of today who constantly jam the media with their pitifully meaningless, staged contrivances, and screaming lack of originality, owe much penance to the moral message contained within the little painting by a follower of Bosch it would seem, ‘A fool and his money are easily parted’. Rather than offering us a glass of water these contemptuous, sneering artists, invite us to drink from their poisoned chalices whilst they wait to see who carries the heaviest purse to their table. Aside from the grubby, onanistic world of contemporary art, with its nauseating hypocrites and one trick ponies, one must turn to ephemeral work for solace. It is possible that some performances could be viewed as a travelling wunderkammer for those people who are sick and tired of the devious excrement that is being peddled as high art for a society glutted on celebrity culture to the point of throwing up. Fed up with warbling wannabes and the chicanery of posturing pedagogues wobbling their arrogant jowls, intelligent people are now seeking an escape in the art of non-western cultures and other forms of creative expression, such as outsider art. Recently, in a performance in France,(‘Cult House’) I took 8 or 9 conical figures manufactured crudely from cardboard yarn bobbins bought on ebay for £1.00. I gave them to a group of art students to decorate, so that their imprint might give the dolls some other form of ‘living’ personality. Beneath each figure I carefully placed talismanic objects which I found washed up by the river Thames. These were intermittently divulged whenever the idols were moved about or clustered together on the tabletop. It occurred to me that my ‘work’ (for want of a better word) has much in common with the notion of a mini-spectacle and employs the same tension of drama and suspense which is built up in the painting by Bosch’s copyist. Although I am not a magician or a trickster by profession (like some of the artists in the age of our great deception), my gambit is orientated and concerned with very odd role play and the subtle relationships with objects loaded with metaphorical/metaphysical import. I have that much in common with the painting of the Magician and for this I am truly thankful to Hieronymus and his copiers.